Gradle’s build cache feature dramatically accelerates builds by storing and retrieving the results of build work in a cache. Gradle Enterprise provides a centralized cache that can be used to share the results amongst different machines and users. The above configuration disables the local cache for demonstration purposes. Disabling the local cache is generally not recommended and this should be removed for real usage. Given the above configuration, you can now run your build with --build-cache. If this is the first time your project is being built while using the remote cache, you will not see any reuse from the cache; only uploads to it. If you run the same build again, you should see output from Gradle indicating that tasks were reused from the cache. The exact numbers you see will depend on how many cacheable tasks your build executed. In order for a task to be cacheable, it must be designed with certain considerations and must declare itself to be cacheable. Many of Gradle’s built-in tasks are cacheable, and increasingly many tasks from third-party community plugins are cacheable. Cache nodes are the caches that Gradle builds connect to. Gradle Enterprise provides a built-in node at https://gradle.company.com/cache, as we have seen. You can install additional “remote” nodes, potentially on different servers, and connect them with Gradle Enterprise. Different projects may produce and reuse task outputs at different rates. As caches are limited in size, with least recently used items being evicted to make space, a project that produces many outputs and is frequently changing may undesirably dominate the cache and result in a low cache hit rate for other projects. Distributing projects across cache nodes may yield higher hit rates. The Gradle Enterprise Admin Manual details how to install and configure remote nodes. Reading the dedicated Build Cache Guide is strongly recommended. This guide provides detailed information about build caching in general, including considerations for using it in practice. It also covers how to debug and optimize build cache usage using build scans. The best roll out strategy depends on your circumstance. A common strategy however is to first enable build cache usage only for CI builds, then later enabling for local development builds. The build cache configuration within a build can be specified dynamically, supporting this kind of usage. Examples of different kinds of configuration patterns are available in the Gradle User Guide. Enabling build scans for any build using the remote build cache should be considered a prerequisite. 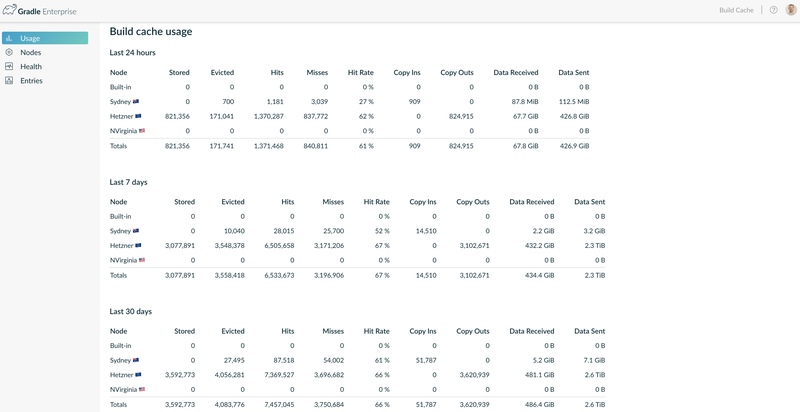 Build scan insights make it considerably easier to debug and optimize build cache usage. To enable build scans for a project, you need to apply the build scan plugin, and specify the address of your Gradle Enterprise installation. Build scans include the console output produced by the build. Many tools used by the build, such as compilers, often write diagnostic information to the console log. View the console log by clicking the Explore console output link in the topmost section of the build scan. Click on any line to highlight it or shift-click two different lines to highlight a block of lines. Note that the browser’s current location has been updated. By sharing that URL with a colleague, you can direct them to the exact console output that you wish them to see. Many aspects of build scans are directly linkable in order to facilitate sharing and collaboration. Search through all of the captured build scans by going to https://gradle.company.com. This view allows searching by various criteria, including root project name, user name, build outcome, build start time and more. By default, the list is sorted to show the most recent scans first. Beyond looking for a particular build scan, the listing can provide new insights into the actual builds being run at your organization and by your colleagues. You may find occurrences of previously unknown errors with your build, or that the build is taking longer in certain cases than you expected, or that certain build users are executing more tasks than they need to and are therefore subjecting themselves to more build time than they need to, and other previously unknown behaviors. Tests are the cornerstone of software development. Build scans visualize test results, including test durations, logging output and outcome. Use the left navigation menu to visit the Tests section. Click on any failed test to see the console output and error trace. Developers can effortlessly share test results of local builds with colleagues via build scans, making solving test failures collaboratively more efficient. Only test results from Gradle’s built-in Test task are currently visualized. Use the left navigation menu to visit the Performance section, and click Explore performance. The Configuration tab provides an interactive breakdown of the time spent configuring the projects participating in the build, highlighting the slowest scripts, plugins and lifecycle callbacks used during the build. The slowest scripts, plugins and lifecycle callbacks are typically the best candidates for optimizing in order to make your build faster. The Task execution tab provides a concise breakdown of the tasks that participated in the build, grouped by outcome. This provides a high level view of task execution and can be used to understand incremental build and build caching coverage for a particular build. The dedicated Timeline section (available via the left navigation menu) provides an alternative view, visualizing the task execution as a timeline. This view provides more detail on individual tasks (click the task name in the list), and more clearly shows the parallel utilization of your build. The Network activity tab lists the network requests made during the build and can be used to identify slow dependency repositories or particularly troublesome requests. For a task to be cacheable, its implementation must meet certain requirements along with its configuration. Build scans make it easy to see which tasks are cacheable, and why those that aren’t aren’t. The Timeline section allows filtering of tasks via certain criteria, one of which is cacheability. 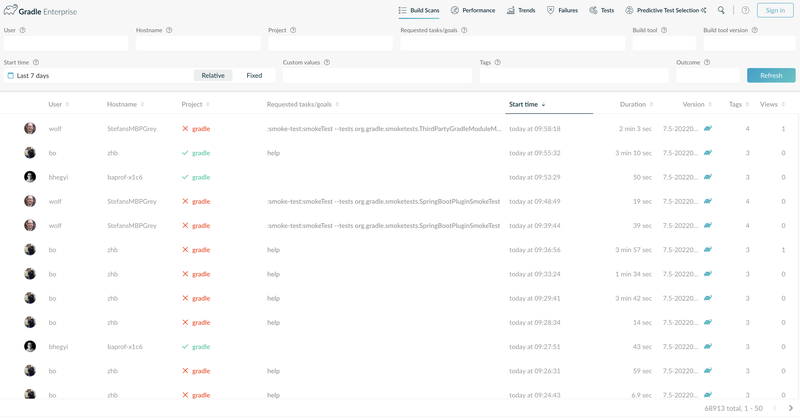 Gradle Enterprise provides the ability to compare aspects of two build scans, including the inputs into the executed tasks, the resolved dependencies, what switches the builds were invoked with and aspects of the build infrastructure such as the environment where the builds were run. To compare two scans, use the scan list to find the scans to compare, selecting them by clicking the respective or icon. Or, from a scan that you wish to compare with another, click the icon at the top of the scan. Each build scan provides an interactive visualization of every dependency configuration resolved during that build. You can search for dependencies across all projects within the build by name, and also by types of resolution such as dynamic version resolutions. Dependency comparison shows the differences in the resolved dependency configurations between two builds. This is useful for highlighting unanticipated changes, and as the entire graph is compared including transitive dependencies, visualizing the full impact of a change. The task inputs comparison is particularly effective in helping diagnose issues with incremental build and build caching, particularly cases where reuse was expected but didn’t occur. In such cases, it is common that a non obvious input has actually changed which is preventing reuse. By comparing the inputs of the task from the builds where reuse was expected, the exact input property with a different value between the builds is immediately apparent. When task outputs are reused in a build, due to incremental build or build caching, the build scan for that build provides links to the build scan of the origin build. This feature can be used to provide an audit trail of build outputs, and for validating reuse. It is particularly useful for identifying and diagnosing incorrect reuse, which is typically caused by under declaration of task inputs. In such cases, the build scan for the origin build can be used to determine the actual input state for cross referencing with the build scan that incorrectly reused the outputs. To see this feature in action, create two build scans where one reuses output from another. The simplest way to do this is by running exactly the same build twice. View the build scan for the subsequent build and open the timeline visualization. Click on the name of any task that was UP-TO-DATE, and click the icon to view the build scan for the build that produced the reused outputs. From a build scan, you can easily navigate to prior or subsequent builds from the same root project directory. This equates to builds of the same project for a particular user on a particular machine. For example, when running two builds consecutively for the same project, from either build scan you can easily navigate to the other. To see this feature in action, create two build scans from the same project. From either build scan, click the icon at the top of the page. The builds that happened before and after the current build are shown and can be clicked to open the corresponding build scan. 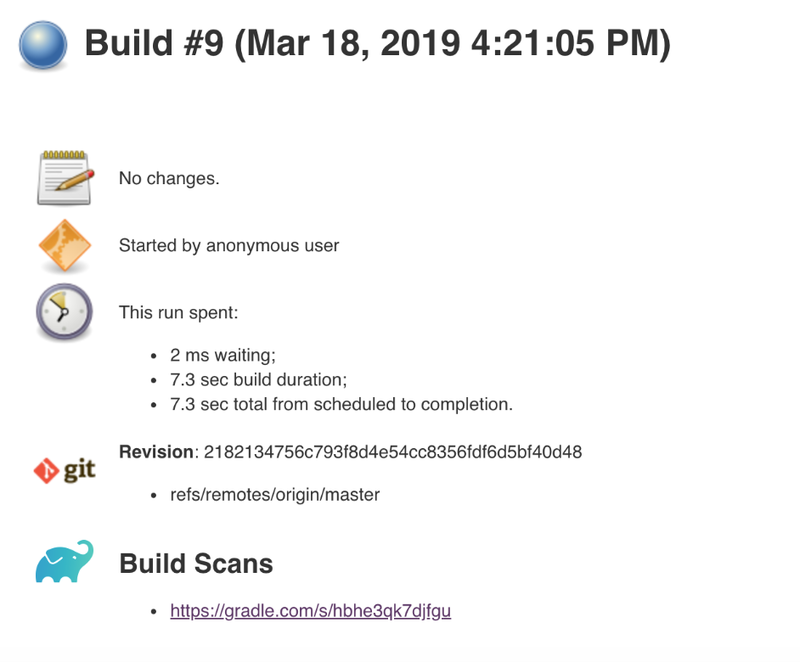 The build scan plugin can be configured to publish a build scan for every build invocation, or, always publishing if certain programmatically defined criteria are met, or, always publishing if the build fails. The dedicated Gradle Build Scan Plugin User Manual provides a section outlining how to do this. Build scans can be enriched with metadata particular to your environment, by using an API provided by the build scan plugin. Several key usages for extending build scans are outlined in a dedicated blog post on the topic. The Gradle plugin for Jenkins prominently displays links to the build scan for any Gradle builds that produce build scans. This makes viewing the build scan of CI builds much easier. A TeamCity build scan plugin is also available that provides a prominent link to the build scan for executed builds. The build scan plugin will not cause build failures, even when there is no connection available to the Gradle Enterprise server when trying to publish. Gradle and Gradle Enterprise are constantly evolving with regular updates that add new features and capabilities. The monthly Gradle newsletter is an easy way to stay informed about new releases, features and Gradle events.